Cat parents seeking a lightweight, plant-based cat litter now have the best choice available to them! 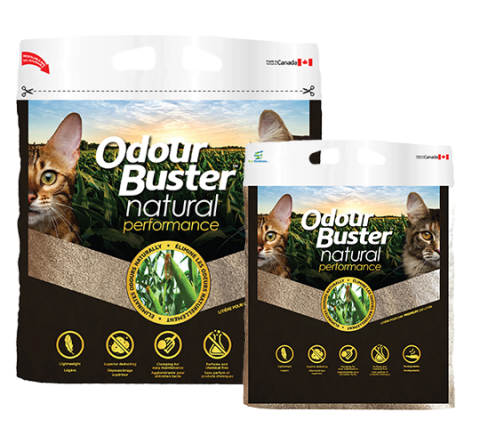 Odour Buster™ Natural Performance provides you and your cat with the most natural, dust-free cat litter that also eliminates odours. 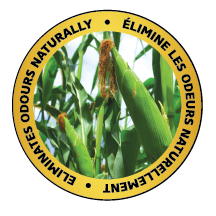 Odour Buster™ Natural Performance combines the properties of the corn cob with our exclusive odour and bacteria eliminating ingredients. The result is simply the best biodegradable cat litter! Odour Buster™ Natural Performance is made from corn cobs repurposed from the agri-food industry. Once the kernels have been harvested for use in foods, the cob doesn’t go to waste! It is dried naturally and ground to create our litter. Corn cobs offer a highly absorbent and renewable source material. Because of this, they are used in many industries where liquid absorption is important. In cat litter, they absorb urine quickly and help to control odours. Odour Buster™ Natural Performance is available in 12Kg and 6.4Kg bags. Why choose Odour Buster™ Natural Performance? Made from naturally dried and ground corn cobs, Odour Buster™ Natural Performance is biodegradable. It uses the power of the corn cob and our exclusive Odour Buster™ recipe to offer your cat a completely natural, safe, dust-free and odour-free litter that is also soft on sensitive paws. Your cats will love it! Odour Buster™ Natural Performance is now available in specialty pet stores that carry Odour Buster™ products. Find a store near you! Odour Buster™ Natural Performance does not contain any clay or fillers. It is lightweight and easy to carry! Odour Buster™ Natural Performance is safe for dust-sensitive cats and humans. Odour Buster™ Natural Performance creates solid clumps for easy scooping and a clean litter box. Odour Buster™ Natural Performance eliminates odours without the need for any added chemicals or perfumes. 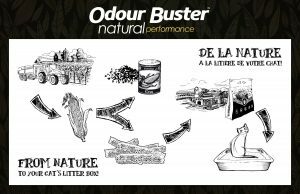 Odour Buster™ Natural Performance is made entirely from plant-based materials and is biodegradable! "With more and more people having cats as complete indoor pets it's great to have a litter that keeps everyone as well as our pets happy. Thank you"
"Odour Buster is the best litter I've used. I have two cats in a small apartment and it never smells and we can leave it for the week and it still holds the odour and easy to clean." "I love Odour Buster! The litter box is in my bedroom and it works wonders!" "Odour Buster is the only cat litter that I use in my home and I highly recommend it to friends and family and customers." "I love Odour Buster, use it for my cats and recommend it all the time!" "I have two cats and use this product, it is the greatest." "I personally adore your product! My customers rave about it, my cats haven't had a better litter in their lives, and I don't have to deal with nasty odours on a daily basis." "I use this for my cat for several years now and find it does exactly as it claims. There is no smell lingering in the house. " "I have tried every cat litter in our store and this is by far my favourite. It is minimal tracking compared to others, no dust and amazing at odour control. "